Triangle Pump | Water Hammer eBook | Triangle Pump Components Inc. 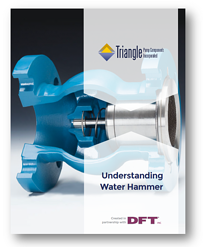 In creation with our partner, DFT, Inc., the Understanding Water Hammer eBook outlines the causes and most effective solutions for water hammer in fluid flow systems and industrial applications. In this eBook you will learn about common causes of water hammer, how they impact your system and some of the basic changes your company can make to eliminate them. Professional recommendations for coping with water hammer.